Nature photographers are known for some of the amazing images that they are able to capture while they are out in the wild. As a matter of fact, they’re the producers of some of the best pictures that you’re going to come across on the net. Sometimes, they’re able to produce some photos that give off an absolutely beautiful effect that just jumps out and grab you and sometimes they can even be considered an optical illusion. This illusion jumped out to me, so I decided to post it up on the site. I have dubbed this as the Camouflaged Chameleon optical illusion. So, what’s the optical illusion about this image? Well, I want you to figure out if that’s actually a chameleon in the image above or if it’s just the way the leaf is shaped in the picture. What do you think? You can take a guess by leaving a comment in the comments section, which you will be able to find by scrolling down. If you enjoy this image, you should leave a rating on this post, so we know if you liked it or not. Lastly, you should get your friends in on this illusion and see what they think. Is there a Chameleon in the image above or not? Totally agree this is a Uroplatus phantasticus. Absolutely NOT a brown Leaf gecko. They look nothing alike. i had no idea they could be that close to their surrounding. It’s a great photo. The critter is called a brown leaf chameleon. It would be nice if you gave less obvious titles to some of the posts. It is more rewarding for us to see it first without any clues whether it be in the title or in the text. 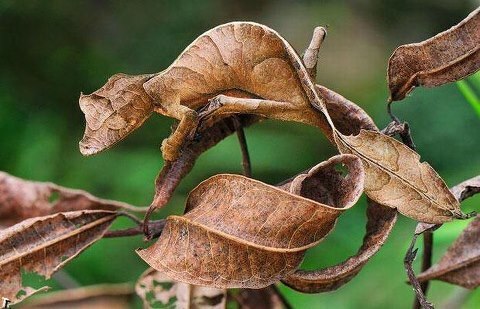 It’s not a brown leaf chameleon. It’s a leaf-tailed gecko (not lead-tailed! ), plus (I’d bet on it) a good dollop of photoshop. It looks like a leaf tailed gecko.